Infected Quarterly (IQ) is a new Arts and Literature magazine being published by ArtOrder LLC in collaboration with Infected By Art. 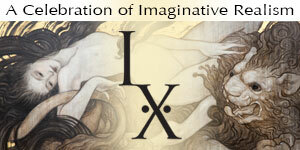 IQ will feature in-depth perspectives and meaningful conversations with talented artists and writers from around the world. IQ will be talking to creatives about real issues that impact their personal lives and their careers...and chances are, yours as well. While Infected Quarterly will be focusing on great conversations, we will also also be featuring world wide exclusives and brand new Art and Literature by introducing illustrated short stories and mini-comics to each issue. IQ will be offering you a fresh take on genre fiction and introducing you to some new voices and artists, or re-introduce you to some industry leaders trying out something new or different. 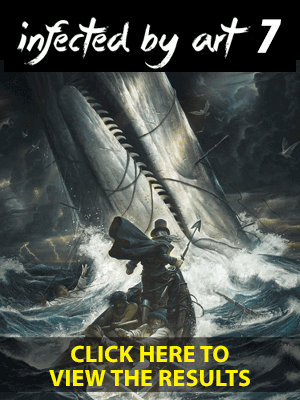 So whatever it is you are looking for: be it inspiration, motivation, curiosity, strength or fulfillment - or you just want to learn more about today’s hottest artist and writers, then start by reading the next pages of IQ magazine. 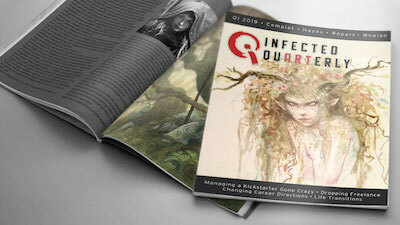 Infected Quarterly will be published four times each year beginning this Spring. While copies will be available for direct purchase we’ll be launching a Kickstarter the week in February which will allow you to pre-order the first four issues along with some great upgrades. If you’re interested in contributing to future issues of IQ as a storyteller, writer or interviewee, we’re quite open to proposals and we’d love to hear from you. Please contact us through www.infectedbyart.com and we’ll be in touch! To stay updated on IQ please signup for ArtOrder LLC's mailing list. As always, thank you for supporting Infected by Art!